Feiwel & Friends, 9781250128133, 192pp. 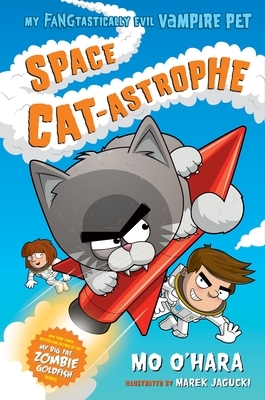 In the second book of this FANGtastic spin-off of Mo O'Hara's New York Times—bestselling My Big Fat Zombie Goldfish chapter book series, an aspiring evil scientist and his mostly evil (and totally forbidden) vampire kitten blast off to Evil Scientist Space Camp. My epic summer has just gotten even more epic, because Evil Scientist Summer Camp just turned into Evil Scientist Space Camp! AND it will be led by the totally epic evil astronaut Neil Strongarm! Who is looking for evil apprentices for his next space mission! Which means that I could totally go into SPACE!! !